Texas Sheet Cake is a perfect example of Texas hospitality translated into food. The legend of Texas hospitality is valid. Texas people possess a friendly spirit and willingness to accommodate that I am certain must exist in other places, but not on such a grand scale as in Texas. That spirit, and Texas food, are probably the things most missed by expatriate Texans who relocate elsewhere. It's certainly not the 108-degree weather. Texas hospitality most certainly extends into wonderful food of every description. Let there be company coming or birth, death, illness, wedding, engagement, graduation or whatever, home-prepared food in covered dishes is going to make the scene. My mother was famous for this. While she did not literally meet planes with fried chicken in both hands, the truth wasn't far from that. Texas Sheet Cake is a perfect example of Texas hospitality translated into food. While it is absolutely delicious and satisfying to the senses, it can be whipped up -- start to finish, baking, frosting and all -- in 40 minutes or less. Ready to commemorate, celebrate or aleviate life events. It&apos;s also perfect when you want something delicious and you want it fast. As with last month's spotlighted dessert, Red Velvet Cake, there are several different versions of this recipe. Our version is formulated for convenience, speed and overall deliciousness. It relies upon butter, not margarine, for flavor, cooking oil for moistness, and cocoa for deep flavor and convenience. This cake, and its frosting, should be mixed by hand; you don't need to drag out your 40-pound KitchenAid mixer or even trot out your portable for this one. And by all means, get yourself one of those 9x13-inch pans with the nicely fitted plastic lids. But be sure and tape your name to the bottom so you don't lose track of it when you make this cake as a gesture of hospitality. Preheat oven to 400°F. Grease and flour a 13x9x2-inch baking pan. Sift together the sugar, flour, cocoa, baking soda and cinnamon, and set aside. Mix the milk and cocoa in a heavy saucepan (stir, stir, stir). Add the butter and, over medium heat, stir until the butter melts. Remove from heat and gradually stir in the sugar and vanilla until smooth. Add the pecans. When the cake is just out of the oven, spread the frosting evenly on the hot cake. Being a chocolate freak, I use just a half-teaspoon of cinnamon in this cake. I want the cinnamon flavor to come through, but I don't want it to overpower the chocolate. If you aren't sure about your oven, you can test it with one of those little dime store oven thermometers. 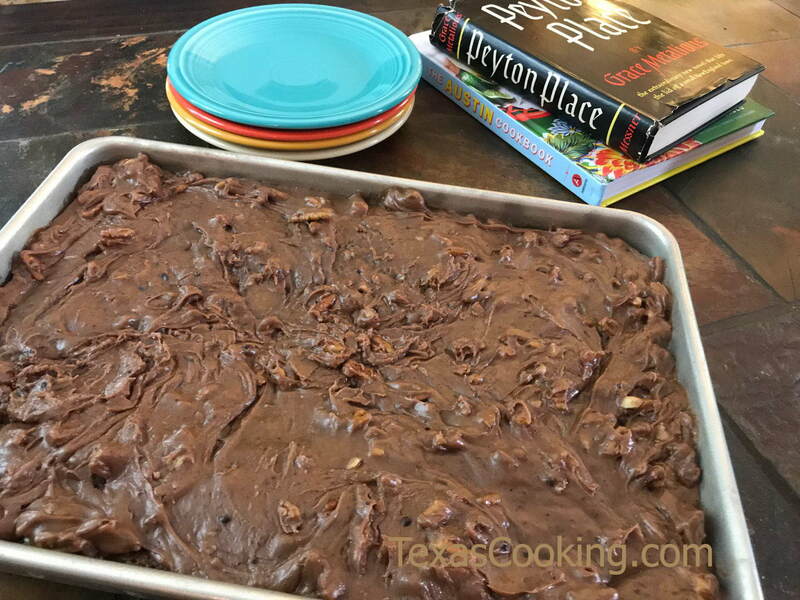 With its comparatively thin batter, Texas Sheet Cake requires every bit of the 400° heat in your oven, if it's going to get done in 20 to 25 minutes. This is a wonderful cake, whether you make it for yourself or as an act of hospitality. You can eat it out of hand or serve it on your best china. Or you can deliver it to someone else and let them make those serving decisions. In whatever way it is served, Texas Sheet Cake will be relished and appreciated.